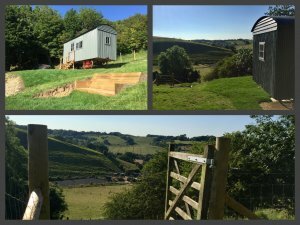 We are excited to announce our new addition to Greenhill Glamping – The Ploughman’s Retreat. This authentic ploughman’s wagon dates from around 1905 and was used as a living van by ploughing gangs, who would use it as a place to live whilst working during the winter. They would travel from farm to farm ploughing with steam engines. The Ploughman’s Retreat is believed to be either Garratt or Clayton & Shuttleworth, both companies of which made steam engines in the 19th and early 20th century. The hut was found in West Sussex and has been brought back to the farm and lovingly restored over the past 9 months, by my husband Neil. Tucked into the bank, surrounded by picturesque views this hut really gives you the cosy feeling. The hut oozes individual character, from the array of vintage furniture that tastefully decorates the hut to the hand-crafted seat outside made from sleepers nestled into the bank, which is the perfect spot to catch the sun and watch the sun go down. The interior of the hut has been restored by re-using the exterior weatherboarding. There is a beautiful Cuban mahogany folding table, refurbished by my husband Neil, which dates from 1760, complimented by 2 late Georgian country oak chairs. The bed area is a cosy retreat, with rustic lantern style lights and a window which gives outstanding views of the farm which you can enjoy without even getting out of bed. Not forgetting the luxury additions, including a home-from-home en-suite shower, heated towel rail and a handmade luxury Harrison king size bed, with goose down duvet and pillows. There’s even a controllable back-ground electric heater when the fire is not lit.